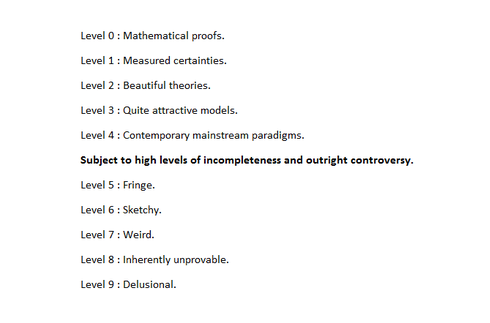 This post will be an examination of fringe theorys and determine where they each fall on the plausibility index. For those unaware, this is basically a hierarchical ranking for science and pseudo-science, and an explanation of what sets them apart. The index is pretty damn useful and allows researchers to avoid the pitfalls of what some have called 'undiscriminating skepticism.' 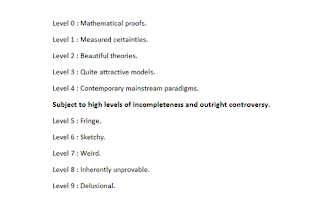 It has ten different levels, with 0-4 being the most reputable, and 5-9 being the least reputable. There are simple criteria for determining the plausibility (or lack thereof) of different scientific and historiographic theorys. This includes their adherence to mathematical proofs and measured certaintys, their internal consistency, their predictive power, and so forth. For the purposes of this article, we'll look at the less-reputable ideas, explain their core thesis, and why they deserve their respective rank. Some may be less objectionable than is immediately apparent: They sound ridiculous when spoken aloud, but in fact posses as much evidential support as the competing theorys. Others are filled with contradictory claims that put them on the bottom of the hierarchy, though. While immensely useful, the plausibility index isn't perfect. One of its core tenets is very questionable: Namely, the assumption that widespread adoption of a theory automatically makes it more accurate and rigorous than those which are not adopted. 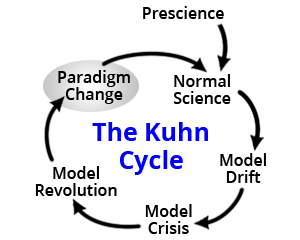 This betrays an ignorance of the kuhn cycle and scientific paradigms. We must remember that germ theory was not universally adopted until the 1880s, even though plausible arguments for it had been formulated roughly 120 years earlier. Its not uncommon for certain fields to enter a dead end with regards to their working theory: This continues to happen even though the scientific method was crystalised centurys ago. Truth be told, some concepts that are in widespread use within a field (I.E, a level 3-4 idea) actually have the characteristics of a level 6-7 idea. A good example of this would be keynsian economics and trickle down effects. These models are popular with banks throughout the world, but are based on irredeemably flawed logic. Unfortunately, this quibble over kuhn cycles and reformation will have to wait for another day. Out of necessity, we'll just use the index as it currently is. -911 conspiracys (MIHOP). Thesis: That the september 11th attacks were perpetrated by elements of the U.S. government. Validity: Logically consistent, strong supporting evidence, and no solid rebuttals. However, it fails to pass through the overton window. -Cold fusion. Thesis: That nuclear reactions can occur at or near room temperatures. Validity: Sound reasoning on the nature of low energy nuclear reactions, and promising results from experiments. But it remains heavily stigmatised after the pons and fleischmann controversy. -Environmental determinism. Thesis: That geography is the main factor in determining how societies develop and compete with each other. Validity: Jared diamonds explanation for why the fertile crescent was destined to become the first center of agriculture is terribly unconvincing. -Aquatic ape hypothesis. Thesis: That human ancestors spent much of their time in the water, which influenced how we came to evolve. Validity: Weak evidence, low explanatory power, and logically inconsistent. -Superluminal velocitys. Thesis: That particles can be made to travel faster than light under certain conditions. Validity: Irregardless of all the supporting math, superluminal velocitys would require that either causality (a level 0 concept) or relativity (a level 2 concept) is fundamentally incorrect. -Revolution in military affairs. Thesis: That expensive weapons systems give militarys a huge advantage over rivals that aren't similarly equipped. Validity: Its a highly deterministic, technocentric theory that downplays the importance of human agency and the viability of countermeasures to weapons systems. -911 conspiracys (no planes). Thesis: That the september 11th attacks did not actually take place, and were fabricated through the use of CGI and actors. Validity: It is unfalsifiable by its very nature. That makes it an entirely self defeating hypothesis, because it has no predictive power and cannot be proven or disproven. -Simulation hypothesis. Thesis: That reality as perceived by human beings is a projected fiction. Validity: There is no conceivable experiment that would determine its authenticity, although it claims to be supported by the many worlds interpretation. -Free energy devices. Thesis: That perpetual motion machines are possible. Validity: Laughable for the simple reason that they violate the laws of thermodynamics (a level 1 concept). In a closed system, energy cannot be created nor destroyed, and entropy will always increase. In 1762, marcus von plenciz wrote a treatise on contagion which postulated that colonys of micro-organisms were responsible for the spread of disease (as evidenced by certain germs being found in ulcerating wounds). This contradicted the prevailing theory of miasma at the time, and did not find any sway with the medical community. Episodes like these demonstrate that the validity of the science alone doesn't determine whether an idea is accepted or rejected. Its important to note the divide between MIHOP and LIHOP. The former is level 5, while the latter is level 4. This isn't all that surprising when considering that the official story has plot holes which are inexplicable without some degree of government complicity. If the CIA and FBI had been allowed to function normally, the alleged hijackers would have been apprehended before they could launch the attack. If the FAA had not been impaired by all the military exercises and drills (and fed disinformation by moles), they would have successfully intercepted all four planes. There are certain exceptions to this, though. Some of the theorys involve only the first landing being faked, due to unspecified technical issues. Other variants acknowledge that while the landings did happen, it wasn't in the manner claimed by NASA. This theory was lamp shaded in the transformers movie, dark of the moon. Consequently, this makes them into more of a coverup than an outright hoax.